2019 will be an awesome year for live music as Dream Rock announces their first two of many shows they will be producing at The Gallipeau Centre Theatre this year. Live in concert Saturday February 9th 2019 Captain Fantastic The Elton John Experience the ultimate musical tribute to one of the worlds greatest and highly respected musicians and performers of our time, Sir Elton John. Since 2009 The Captain Fantastic Band has succeeded in establishing themselves as Canada’s leading Elton John tribute show. Their professionalism and sheer enthusiasm both on and off stage, have secured them a reputation beyond reproach. The voice and charisma of Donnie Leafloor as the The Captain plus a selection of Ottawa’s finest professional musicians, who together form The Captain Fantastic Band, make this an incredible musical showcase. This spectacular act will take you on an amazing journey, from Elton’s earliest Tin Pan Alley days and on through his extensive songbook of timeless classics. The Captain Fantastic experience aims to perfect the essence, atmosphere, style and showmanship that we have come to love and expect from this musical legend. The Captain Fantastic Band’s performances include over thirty of Elton’s masterpieces, including: ‘Crocodile Rock’, ‘Don’t Let The Sun Go Down On Me’, ‘Your Song’, ‘Levon’, and many more. The Captain and The Captain Fantastic Band are truly outstanding musicians and performers, who continue to portray Elton John’s music to thousands of music lovers in both Canada, and the US. ‘The Elton John Legacy’ is an incredible celebration of Elton’s musical career spanning 5 decades. It’s an energy packed show with a brilliant performance that’s not to be missed. Queen Flash: Canada’s Premier Tribute to QUEEN. Queen are one of the biggest legends in the history of ROCK! The famed British glam-rock band reached the top of U.S. and U.K. charts with songs like “Killer Queen,” “Bohemian Rhapsody,” “We Will Rock You” and “Another One Bites the Dust.” These and the many more huge hits of the band included the talents of Freddie Mercury, Brian May, John Deacon and Roger Taylor skyrocketed Queen to top the charts all over the world. Queen Flash is a must see for all Queen fans! You may have already seen the movie Bohemian Rhapsody; now it’s your chance to experience what it was like to see Freddie Mercury live on stage. 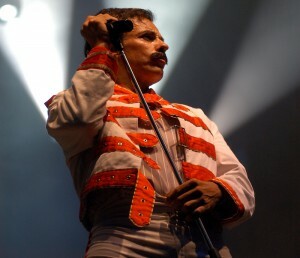 Look-a-like, sound-a-like, Johnny Zatylny has been captivating audiences by carrying on the musical tradition of Freddie Mercury since 2000. His amazing likeness with the original matches his perfect performance of “Queen” songs both through his voice and his unmistakable stage presence. This fabulous 6-piece Queen tribute is an exciting, high energy show that will get people out of their seats. Queen Flash is a grand, theatrical representation of the real Queen concerts, complete with vocal quality unmatched by any other tribute out there. It captures the essence of a band that transformed the music industry and set lofty standards for those who followed. Queen Flash will set the stage for a flash back to one of the world’s finest group of rock musicians! Dream Rock has many more upcoming shows to be announced for 2019 that will included Original Artist, World Class Tributes and Comedy Nights! Visit www.dreamrock.ca for all the details.